Jordan: "Yes, I don't know." continued to point in opposite directions as if they were both giving me a legitimate answer. Which, perhaps on higher philosophical plane, would be correct—after all isn’t life of a circle we all spin around? Even “Do you have green tea?” got me the response at a café. “Yes, no.” It took me several more questions to figure out whether the yes was more correct than the no. The truth was he didn’t know if they had tea at all, which I gathered from the various other “yes, no” responses. Never saying “I don’t know” seems to be a phenomenon among the 20-somethings of Jordan. There are questions in Jordan for which they have no answers but these are matters strangers don’t discuss in public—“Is it likely I’ll get a job?” “How will I pay for heating this winter?” “Which one of our neighbors –Iraq, Israel, Egypt, Saudi Arabia, Syria—will be the most unpredictable this week?” Big questions for which people are afraid of the answers. But people want to be able to answer something. So maybe that’s why a less earth shattering question like “Do you sell Jason Shampoo?” gets answered “yes” by the cashier and “no” by the clerk in a shop the size of a big living room. The real answer was no, but that didn’t make the yes man feel bad. He just shrugged, like he had a 50-50 chance at being right. “I don’t know” just doesn’t have that definitive power of taking a 50 50 chance of being right, which are about the same odds for a long lasting marriage, all Jordanians take that risk. After more than an hour and a half of elaborate directions from about 10 people who “yes,” knew where to get a Blackberry battery and then finally running into the Blackberry store by complete accident, you just want to throw some one for a spin by asking, “What do you think are the advantages of the Blackberry over the iPhone?” If no one knows the answers to the little questions, then dare to ask the big questions. 2. The Dead Sea: Take a mud bath at the lowest point on Earth. 3. 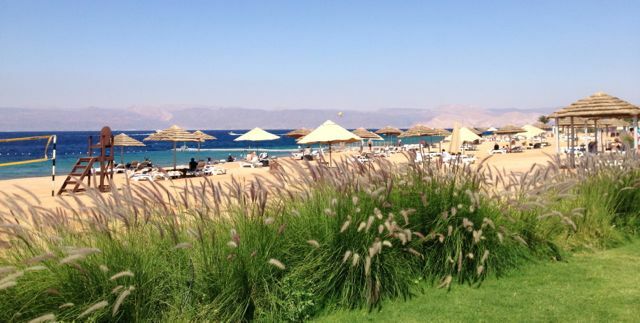 Aqaba: Swim and sun at the Red Sea. 4. Jebel Musa: Where Moses saw the Promised Land for the first time, and near the old but still bustling town of Madaba, with its historic church. 5. Jesus Baptism Site: I often wonder what Jesus would think about people look up from the water to find themselves starring at an armed Israel solider standing guard just on the other side of the narrow Jordan River. 6. Jerash: The old Roman amphitheatre is especially fun if it’s the Jerash festival, and especially if you eat kebab at Abu Yahya’s overlooking the valley. 7. Wadi Rum: Live out your Lawrence of Arabia fantasies in a group tour. 8. Karak: Fascinating ruins near the mountaintop city of Salt. 9. Pella: Yes, more ruins and another chance to see more of Jordan’s otherworldy landscape. 10. 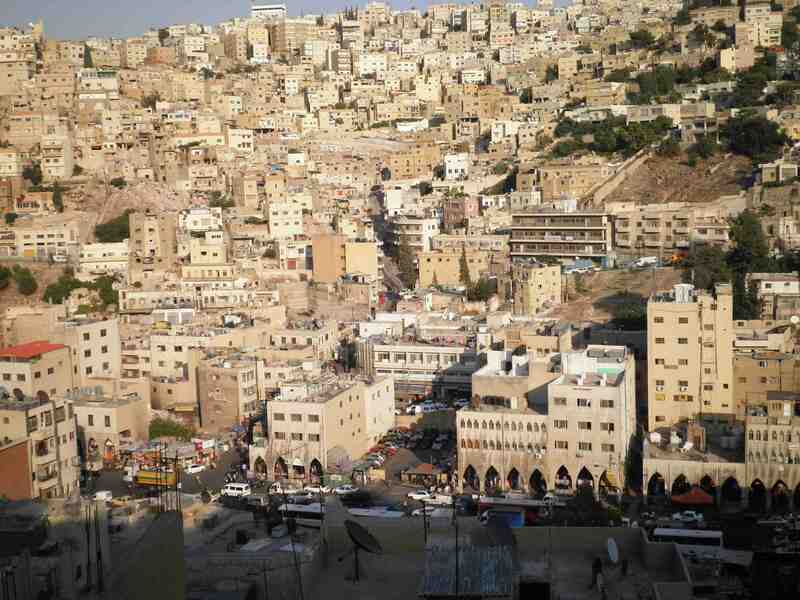 Downtown Amman (if you must and only if you’ve never seen any other Middle Eastern downtown): The gold souk, the dirt and crowds, the mom and pop shops, and Hashem, the popular falafel and hummos spot that takes up both sides of an alley. All the above things are things I rarely do, unless I have tourists in tow with me—seen one of the great wonders of the world five or ten times, and it’s like you’ve seen it a hundred. But for people who are going to stay longer, I’m going to start mentioning these things, too. 1. Ajloun: The best views and weather in Jordan. 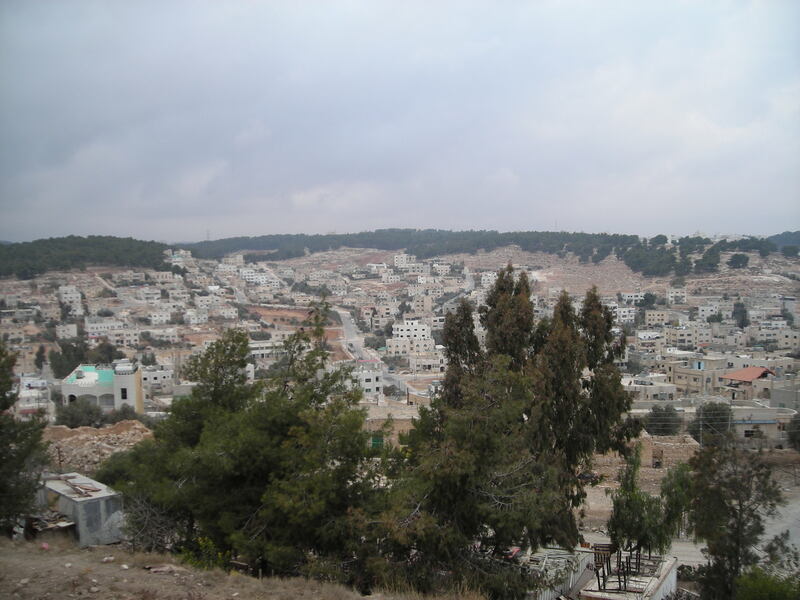 At Saladin’s old fort, you can look out and see Jerusalem on a clear day, just as Moses did at Jebel Musa. 2. Dana Reserve: Where the deer and the antelope play. 3. Ma’een: A natural hot springs deep in a gorge, and now with a luxury hotel. 4. The Houses of West Amman: This “I can build a bigger mansion than you can” neighborhood actually offers spectacular views. Park at the Abdoun Mall and head for the hills from there. 5. 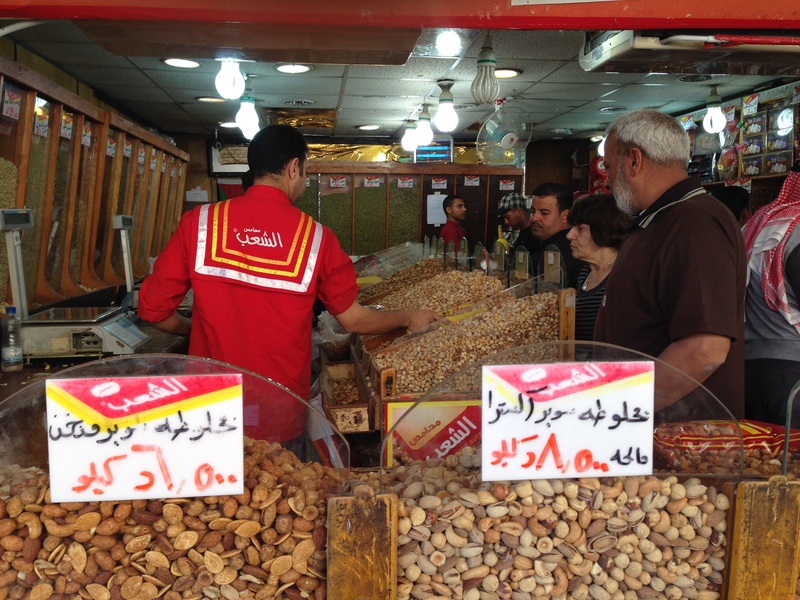 Wikalat Street: A pedestrian-only street of stores and cafes anchoring the Suweifeh neighborhood, which amongst its many divergent streets offers up shops that specialize in honey, chocolate, spices, or cheese, and selling everything from evening gowns to screwdrivers. 6. Jabri Restaurant: Mansaf is the national dish of Jordan, and Jabri’s mansaf, although it has been served at royal and state gatherings for decades, is for everybody. 7. The Palestinian Refugee Camps: A painful reminder that all is not well in the world. 8. Palestine: The border is half an hour a way, and the Palestinians in Jerusalem and elsewhere on the West Bank need the boost of tourism. One of the last things I did before leaving Jordan this week was to go into the backyard of my family’s home to see if another fig was ready for the picking. It’s also the first thing I’d done when I arrived there, upon my mother’s insistence. We’re a family that gets pretty excited about blooming fruit. While I certainly also embraced the apples on their tree and the grapes on their vines, there’s something magical about the fig, perhaps because it’s so hard to find in its green and pink perfection of sweetness, unless you literally have a tree in your back yard. 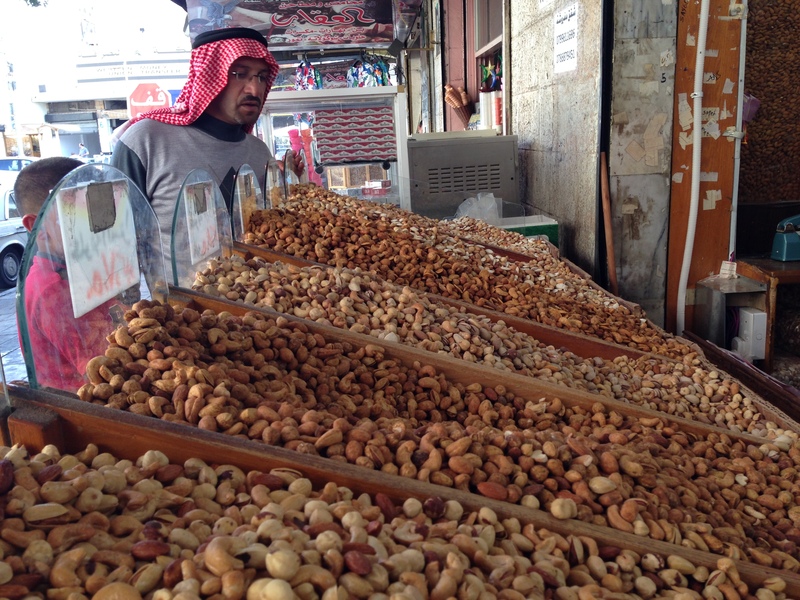 I had never been in Jordan at this time of year, and so the last time I had had this privilege was years ago when I had lived in Athens and Beirut, where peddlers used to walk by with carts teeming with freshly picked figs. I understood better then Fatima’s obsession with the fig tree in “The Night Counter” than I had before. So while the fig was Fatima’s eureka moment, I had mine picking a fig off a tree in Jordan—I learned that it is possible for a writer to understand her characters even more after she’s literally closed the book on them. When my uncle came over later that day, he went off on another book, talking about how the figs leaf outfits and numerous other references to figs shared by the “people of the book” or Old Testament, as it is better known in the US. * Not so fascinating when you consider that those stores were pretty much set right where we were sitting. But, if we were just talking figs, those stories could have also been set in California, the U.S.’s fig supplier. But because figs are so delicate, it’s hard to even get them to the Santa Monica Farmer’s Market in tact, let alone deliver them to the rest of the country. The difficulty of transporting them is why it was possible for me have a conversation with my Florida-born nephew once in which he said, “I know raisins come from grapes, but what do figs come from?” “Figs,” I answered. “But before they were figs, what were they?” Even if I could have torn him away from his Xbox to get a fresh-ish fig one at the finest grocery stores in town, it wouldn’t have been juicy and bright pink. It’d have been a little tired and a lot happier if it had been allowed to dry up and go into his Cliff Bar. There are scores of recipes for fresh figs, but really that seems wasteful. Your time could be better spent than trying to improve on perfection. 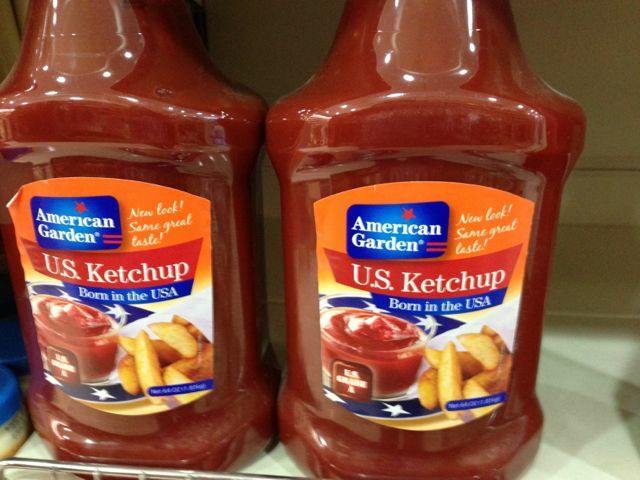 But if you do insist on jazzing them up a bit, a side of white cheese is really all you need.